The math goes like this: Rock 'n' roll is simple. Tom Petty is simple. Tom Petty, then, is rock 'n' roll. Logicians can quibble with the equation, but let's keep this, well, you know. 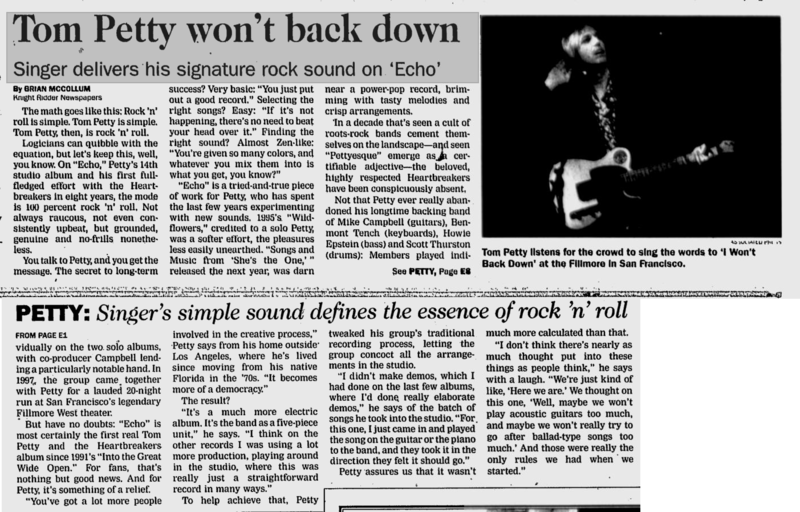 On "Echo," Petty's 14th studio album and his first full-fledged effort with the Heartbreakers in eight years, the mode is 100 percent rock 'n' roll. Not always raucous, not even consistently upbeat, but grounded, genuine, and no-frills nonetheless. You talk to Petty, and you get the message. The secret to long-term success? Very basic: "You just put out a good record." Selecting the right songs? Easy: "If it's not happening, there's no need to beat your head over it." Finding the right sound? Almost Zen-like: "You're given so many colors, and whatever you mix them into is what you get, you know?" "Echo" is a tried-and-true piece of work for Petty, who has spent the last few years experimenting with new sounds. 1995's "Wildflowers," credited to a solo Petty, was a softer effort, the pleasures less easily unearthed. "Songs and Music from 'She's the One,'" released the next year, was darn near a power-pop record, brimming with tasty melodies and crisp arrangements. In a decade that's seen a cult of roots-rock bands cement themselves on the landscape -- and seen "Pettyesque" emerged as a certifiable adjective -- the beloved, highly respected Heartbreakers have been conspicuously absent. Not that Petty ever really abandoned his longtime backing band of Mike Campbell (guitars), Benmont Tench (keyboards), Howie Epstein (bass), and Scott Thurston (drums): Members played individually on the two solo alums, with co-producer Campbell lending a particularly notable hand. In 1997, the group came together with Petty for a lauded 20-night run at San Francisco's legendary Fillmore West theater. 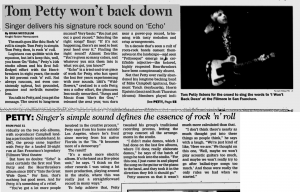 But have no doubts: "Echo" is most certainly the first real Tom Petty and the Heartbreakers album since 1991's "Into the Great Wide Open." For fans, that's nothing but good news. And for Petty, it's something of a relief. "You've got a lot more people involved in the creative process," Petty says from his home outside Los Angeles, where he's lived since moving from his native Florida in the '70s. "It becomes more of a democracy." "It's a much more electric album. It's the band as a five-piece unit," he says. "I think on the other records I was using a lot more production, playing around in the studio, where this was really just a straightforward record in many ways." To help achieve that, Petty tweaked his group's traditional recording process, letting the group concoct all the arrangements in the studio. "I didn't make demos, which I had done on the last few albums, where I'd done really elaborate demos," he says of the batch of songs he took into the studio. "For this one, I just came in and played the song on the guitar or the piano to the band, and they took it in the direction they felt it should go." Petty assures up that it wasn't much more calculated than that. "I don't think there's nearly as much thought put into these things as people think," he says with a laugh. "We're just kind of like, 'Here we are.' We thought on this one, 'Well, maybe we won't play acoustic guitars too much, and maybe we won't really try to go after ballad-type songs too much.' And those were really the only rules we had when we started."